Last year was the year of quirky travels. Or so we think based on the massive number of offbeat destinations, amazing new and secret resorts, and travel experiences like living in an igloo tent. But if you didn't have the chance to check out of work, and check into a holiday, then fear not. We've rounded up the best of the best so you don't miss out in 2019. Go forth and travel! Nestled away in the hills of Vagamon, Little Flower Farms is a gorgeous hideout which has a secret spring pool and a deck that overlooks the valley. Once a farmhouse, the eco-friendly homestay is palatial, ancient and surrounded by spices, fruits, vegetables, and the local avian and animal folks. Not that you will stay indoors much, but the homestay comes with four rooms, which can all be booked out if you are planning a family (or squad) vacation. What we love most is that they even have a tie up with a paragliding outfit named Fly Vagamon for you to really take that vacation to the next level! You can happily live in an Igloo hotel without hitting up the Arctic circle. You will have to go up to Ooty for this though. Essentially a campsite with tented accommodation and rustic living, there are a few transparent tents, that are shaped like a dome, and resemble an igloo. 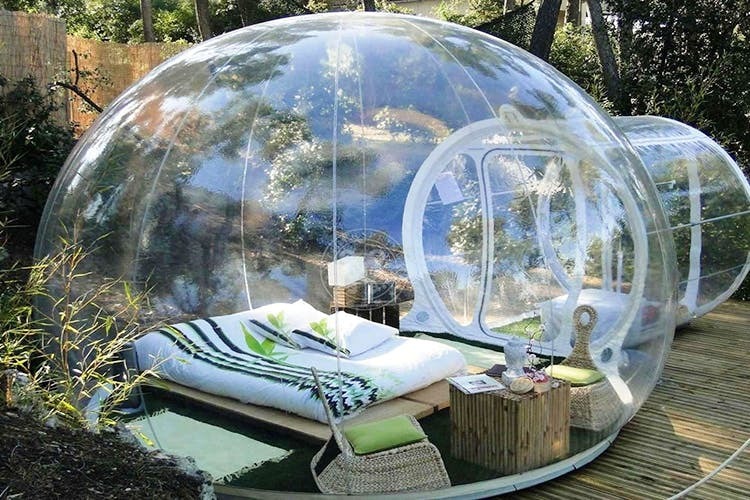 Living in a bubble where you can see the rain fall from the sky sounds amazing and at night, it is just magical! Get away from the city life and escape to Creek In The Wild where you can unwind by the river, relax in Kerala-style cottages and trek till you find your way back to the homestay. With the rolling hills on one side, and paddy fields on the other, you might want to spend all your time outdoors. They organise safaris, nature walks for the noobs, and proper treks for the adventurous as well as village walks that will give you a glimpse into the life of local. Cottages are rustic, and made in the typical Kerala-style Ezhamuri ones, so you get the real feel of the region. Located inside a vast coffee plantation, the Hebbe Falls are a proper hidden gem. Set in the quiet and gorgeous hill station of Kemmangundi, you’ll have to trek a 10 kilometre trail to get to the waterfalls. Perfect for the adventurous sort, you can then check into Chikmagalur for a night to relax at these homestays. Manjarabad Fort is one of those majestic forts that's stood the test of time and offers visitors stunning views, a peaceful picnic spot, and a chance to catch up on history. And the most amazing thing, the entire fort area is the exact shape of a star. Although the shape is hard to tell from a ground level even if you were to walk around the perimeter, you will get an idea. The eight walls with the bastions that project out like arrowheads are what gives the fort its unique shape. The views are amazing, given that it's above 3,000 meters above sea level. On a good day, you can see as far as the Arabian Sea. Or, use a drone! A spectacular property with pale blue walls, cosy nooks, and a terrace that looks out to Serenity Beach, this is what you call prime spot! Listed on Airbnb, Casa Vista works well if you plan to go to Pondicherry for rest, to soak in some Vitamin D (or Vitamin Sea! ), or some refreshing yoga. Why? Because this home itself will let you do all of this! It’s like a private beach experience, but for just INR 800 a night! A gorgeous property with pools all around Kerala-style villas, OYO Century Village Resort in Wayanad is a great choice for a long weekend in God’s Own Country. Remote but not cut away from the city life or devoid of any modern amenities, the resort has a 24-hour front desk, room service, WiFi, and spa to keep things all cool and comfy. Check into Kerala-style villas with the water-front villa easily stealing the spotlight from the rest of the place. A short, picturesque drive from Dubare (the elephant camp), Chikhole Reservoir is a small dam that served the local fields,. The calm water body nestled in forest land and surrounded by graceful hills is ideal for a picninc. The crowning glory of the reservoir is the crested cascade that the dam forms and the waters gushing through make for a great view and are worth capturing. Planning a road trip with the squad? Ditch the car and instead, take to the roads with Trippy Wheels' caravans. Yup, I said caravans! The caravans are fully furnished with a stove, basic ingredients, utensils, beds, pillows, music system, AC, and charging ports. Not quite your Enid Blyton ones, but with the same feels! The per day rental charges are INR 8,000 and is inclusive of a full tank and 24/hour support and depending on the caravan, with or without a driver. Located in Tipam, one of the seven Tai Phake Villages in Dibrugarh district in Assam, this place is an unexplored paradise. Just getting here is an adventure – you have to cross the dense forest of Dehing Patkai Wildlife Sanctuary. You get to stay in bamboo cottages made by villagers and it’s all pretty reasonable – INR 1,300 for dormitories and INR 3,200 for doubles (includes meals). There’s a Buddha Temple nearby and you can go on treks, fishing and boating on the river.